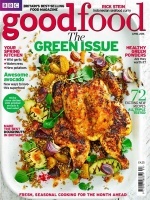 Good Food Magazine is the perfect choice for anyone who loves cooking. Each issue is packed full of over 100 recipes for a huge range of meals, from simple snacks, to full on feasts and includes dishes from top celebrity chefs. Every issue, Good Food Magazine brings you new ideas for making delicious meals in the kitchen. A TV section includes recipes from popular cooking shows, with tips and detailed instructions on how to perfect each dish. The only difficult thing will be deciding what to cook next. Don’t miss out – subscribe to Good Food today! 101 winter recipes – home cooking you’ll love… Seasonal dishes – sausages, bonfire treats, warming soups and sides… Relaxed weekend entertaining – easy freeze-ahead menus… 107 recipes to keep you eating well on a tight budget – quick mid-week meals. Make a batch and then freeze… Autumn flavours – mushrooms, pears and game… Relaxed summer food to enjoy outside… The ultimate dessert – half fat Tiramisu… Rick Stein’s kebabs… Free pasta cookbook with over 40 delicious recipes… For more great features every month, order your Good Food Magazine subscription now.